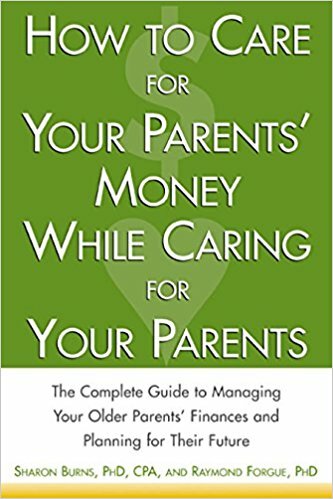 Sharon Burns, Ph.D., C.P.A., and Raymond Forgue, Ph.D. How to Care for Your Parents' Money While Caring for Your Parents (McGraw-Hill, New York, NY, 2003; 294 pages). The children of aging parents are often called upon to be not just physical caregivers but financial caregivers as well. Managing an older person's finances and planning for their future requires a fair amount of knowledge of budgeting, taxes, insurance, investing, and credit, not to mention Medicaid, wills and trusts. This book by two financial experts who are managing their own parents' financial affairs is a valuable primer for those who are involved in their parents' financial lives. The comprehensive book covers everything from basic money management to estate planning in a readable way that is punctuated with numerous worksheets, checklists, and money-saving tips. In the book's first section, readers learn how to figure cash flow and current financial status, develop a budget, solve debt problems caused by credit, and understand the tax issues relevant to retirees. The book then moves to discussions of protecting parents' assets through insurance and appropriate investments, including an exploration of investment fundamentals and Medicare and Medicaid. Later sections cover housing options, common frauds perpetrated on the elderly and how they can be avoided, and procedures for transferring an estate. Throughout, the authors are sensitive to and address the inevitable emotional issues that arise whenever money and family mix.